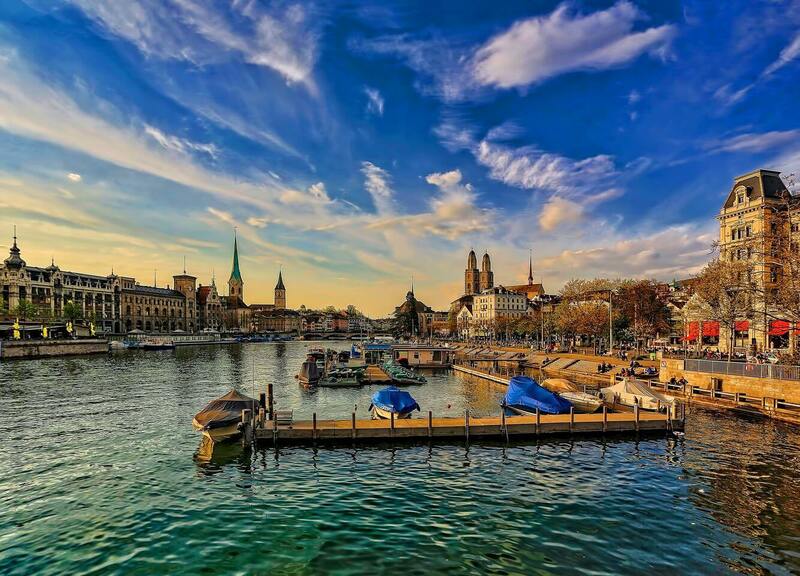 Zurich with its beautiful lake, the stunning Alpine views, and cosmopolitan air is one of the most attractive cities Switzerland has to offer. Because it is the largest city in the country and works perfectly as a base for any Switzerland holidays, we want to show you the best places to stay in Zurich. As Swiss locals, we know exactly what to look for in choosing the best Zurich accommodation. The best area to be in the middle of all is the Zurich City Centre. Here you find something for every taste, be it shopping, sightseeing or eating/drinking. The City Centre Zurich is also great for everyone who enjoys an exciting nightlife. Did you know for example that Zürich Altstadt (Old Town) boasts the highest concentration of clubs per square meter in the whole of Switzerland? Accommodations in Zurich are available in every price class, although you will struggle to find a very cheap hotel in Zurich. One of the most luxurious 5-star hotels in Zurich City Centre. Baur au Lac features 119 rooms and suites and is set in its own park. The Hotel Restaurant Pavillon earned 18 points by Gault Millau and 1 Michelin Star. Baur au Lac offers medical massages, physiotherapy and a beauty salon on site. One of the oldest hotels in Switzerland and the best hotels in Zurich. Suites and rooms of this Zurich luxury hotel offer a view over the river. WiFi and air conditioning are included in all rooms. This elegant hotel in Zurich has its own pier and a terrace overlooking the Limmat River. This accommodation in Zurich offers 18 guestrooms, including air-conditioning, mini bar, writing desk and bathtub. Lake Zurich is less than 200 meters away and you can find the lively Papa Joe’s American Restaurant & Caribbean Cocktail Bar directly in the hotel building. In the heart of Zurich City Centre, you can find the beautiful Hotel Scheuble which delivers 4-star quality for a 3-star price. This great Zurich hotel was built from the old Zurich city-wall. It’s located in close proximity to Zurich main railway station. Most of Zurich’s sights are easily accessible by foot. Reasonably priced hotel Zurich Old Town. 5-minute walk to the main train station. Central but still in a quiet location. Rooms come with free WiFi, flat-screen TV and private bathrooms. Surrounded by loads of restaurants and public transport stops. Budget hostel in Zurich Old Town. Offers beds in 4- and 6-bed dorms, private rooms and apartments. Shared kitchen, WiFi, breakfast buffet and luggage storage available. This cheap stay in Zurich is surrounded by bars, boutiques and restaurants. Some of the most scenic accommodations in Zurich are found close to the lake. While they might not be the cheapest hotels in Zurich, they will reward you with dreamy views. You will not find any budget hotels in Zurich around the lake, except of course if you like camping. Located in the lively Seefeld quarter with only a few steps to the lake and the famous Opera House. Probably the best boutique hotel in Zurich. Excellent restaurant with French cuisine. Free WiFi and a flat-screen TV with MP3 connection included. One of the top 4-star hotels in Zurich. Offers beautiful mountain and lake views. Rooms are designed by the famous architect Tilla Theus in a 20’s style. The Zurich Opera House is only a 3-minute walk away. This 4 star hotel in Zurich offers a sauna and a fitness room. Luxurious accommodation in Zurich Switzerland. Comes with a terrace overlooking the lake and mountains. This extravagant villa offers a kitchen, free WiFi, air conditioning and a barbecue. Car rental service is available at the property. Perfect for bigger groups as it has 3 bedrooms. Perfect for a home away from home experience. These luxurious apartments in Zurich come with a well-equipped kitchen, including a dishwasher. Choose between a 3-bedroom apartment or penthouse apartment. Seeloft offers a garden and a terrace with majestic lake and mountain views. Air conditioning included. Car hire possible. The only camping in Zurich. Perfect for low budget holidays. One of the cheap places to stay in Zurich. You can come with your own tent/caravan/van or rent one on site. You can even get an Airstream or a Safari tent for some nights. Restaurant and Wakeboard Academy on the camping ground. Various price categories. Zurich offers very good public transport, so it’s convenient to get around. Because of this, it is also uncomplicated to stay outside the city centre. Especially if you have a tight budget this is the best area to find some good hotel deals. We also include airport hotels in Zurich and mountain hotels with great views in this category. The best hotel in Zurich. Situated on a mountain next to a cog railway station. Offers a 4’000 m2 spa area including an outside pool with panoramic view, 2 award-winning restaurants (2 Michelin stars) and free WiFi. Free shuttle service to Zurich available. Luxurious Zurich Airport accommodation. Offers direct walkway to all terminals and airport train station. Equipped with a fitness room and a spa. The hotel bar has a choice of 4’000 bottles of wine and champagne. Spacious, soundproof rooms. 3-hour express laundry service available. Great 4-star hotel on the car-free Uetliberg mountain in Zurich. Offers superb views and loads of hiking paths. Only reachable by 20-minute train ride from Zurich main station which goes every 30 minutes. Sauna with a panoramic view over Zurich including a tropical rainfall and unique ice grotto. Best rated airport hotel in Zurich with affordable prices. All rooms come with an own balcony, a flat-screen TV and a private bathroom. Some rooms also offer a kitchenette with a fridge and a microwave. Airport transfer can be easily arranged. Cheap accommodation in Zurich is difficult to find, but this guesthouse offers probably the cheapest rooms in town. Rooms are upstairs while a beloved cafe and bar is downstairs. Rooms are reasonable calm, trendy and share a bathroom. The cafe specialises in delicious pancakes. Free WiFi available. Not too far away from the city centre. Cheapest hotel in Zurich, but only accommodates women. Rooms have a private bathroom with shower. Shared living room with rooftop terrace and fully equipped kitchen. Free coffee for breakfast. Every guest can use a private secure kitchen cupboard. Washer and dryer available for a small surcharge. 5-minute Tram ride to the main train station. If you haven’t found your perfect Zurich accommodation with these picks, then have a look at this inspiring Deals Finder to find many more hotels in Zurich. When we travel, we often also use Airbnb to find some alternatives to hotels, especially if we’re looking for apartments. Click this link to claim your personal US$40 voucher for your next trip if you aren’t registered yet. You want to go to Zurich but don’t know what to do there? Then click this link to have a look at these great tours, trips and attractions or have a look at these 13 amazing Zurich tourist attractions. Are you looking for inspiration for your Switzerland trip? Then click here to read our other Switzerland posts. In case you still want to know more about this stunningly beautiful country, have a look at those great Switzerland guidebooks from Lonely Planet and Rough Guides. Best Hawker Food in Penang – 10 Dishes that Will Make You Want More! Hi Lexi, thank you for your comment 🙂 The photo was taken by Ricardo Gomez Angel, I mentioned him at the end of the post if you’d like to see more of his photos. I need to check out the Sorell Hotels, thank you for the tip.